I spend most of each workday sitting in a chair, the only movement in my body are my hands that are constantly typing on the keyboard or clicking the mouse. Working at a web design company, my job is all technology-based and there isn’t much walking around in my day. Recently, when researching blog ideas for Nextfly, I was introduced to the idea of being healthy in a technology-based office. It’s true that when I get into the office, I am sitting at a computer for the whole 8 hours each day. I do, however, take breaks to go to the bathroom frequently. (I drink a lot of water!) These breaks, however, are not enough! I find myself having uncomfortable backaches mid-day and frequent soreness in my shoulders. Research by fitness experts has shown that the simple act of getting up helps office employees think better. In fact, Jack Groppel, vice president of Wellness & Prevention, a consulting group owned by Johnson & Johnson, has advocated a program that calls for standing up and walking around in the workplace for one or two minutes about every half hour, a process that he says would increase productivity. Now comes the question: how can I incorporate good health into my work days? To start, I did some research. I came across this article from about.com titled “Ways to Walk 2000 More Steps a Day” and took notes. Many suggestions from the article included parking far away or walking to a bathroom further away, which weren’t applicable to me. Rather than phone or email, walk to a coworker’s office and talk to them live. Marching Minutes – every 30 minutes get up from your desk or easy chair and do 1-5 minutes of walking in place and stretching your arms, shoulders and neck. Before eating lunch, take a 10 minute walking break. To put these into action, I felt it was important to have reminders set throughout the day. I did research and found an iPhone app that let me set an alarm every 30 minutes that reminded me to go on a walk. 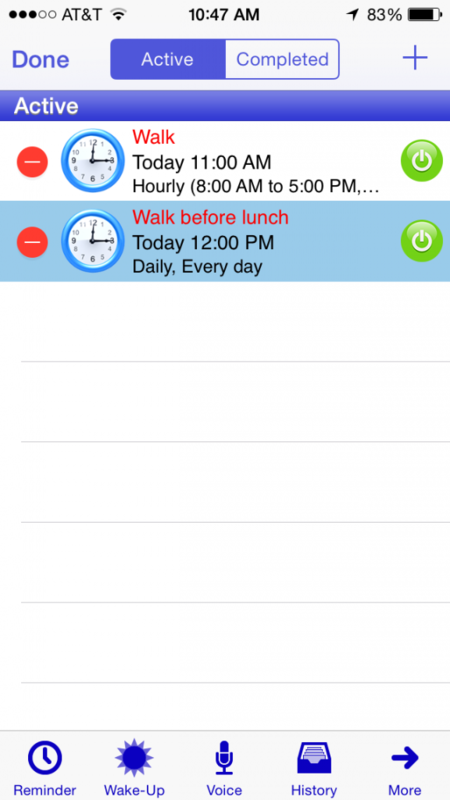 The app’s name is Aida Reminder and is available in the iTunes app store here. I set the alarm to go off every half hour between 8:00am-5:00pm. So far – it has been the most annoying alarm ever. It goes off at all the wrong times – in the middle of content writing, optimizing, etc. Just since starting this blog post and setting the initial alarm, I have already had difficulties keeping up – which is to be expected. However, having the 30 minute reminder prompts me to acknowledge my stillness and, at the end of the day, getting 2 walks in out of 16 is still better than none. I’m making progress and, one day I’ll write a blog about how things have changed since beginning my efforts to improve. Until then – wish me luck. Seems like I’ll need it!